Seven members met at a murky Carlton Lees car park and enjoyed increasingly warm and pleasant weather during the morning. It was a T Shirt day reaching 20 degrees! We walked 9.2km and identified many trees enroute helped by our antique Observer Tree books. A lovely time of year to see tree shapes and buds with plenty of helpful colourful leaves left. Tea at the garden centre (making it a 6 mile walk for some!) completed the day for a few of us. What a great weekend! 17 people gathered in the Y.R.C. hut near Clapham. The hut was very well equipped and cosy with a lovely open fire. Thanks to all who brought wood and coal. Friday night was a boozy one in front of the fire, putting the world to rights and having a laugh. 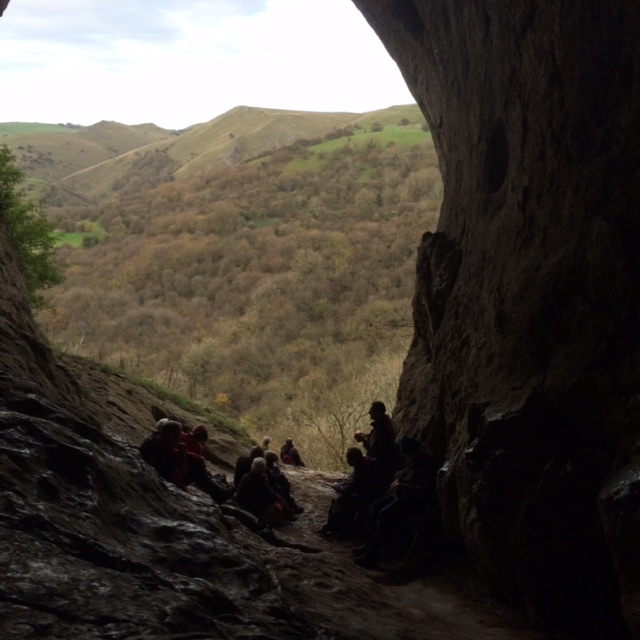 On Saturday, there were 2 cycling groups and 3 walking ones, as the weather was not quite good enough for climbing. 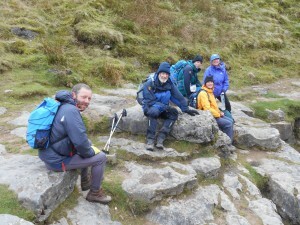 The walkers bagged Ingleborough and Pen Y Ghent, and coped with a strong wind on the tops. One cycle group did a route with Settle cafes in, and the other lot went to the Forest of Bowland. Both groups cycled directly from the hut. The Forest of Bowland produced an amazing long descent, considered by Mike to be the best he had ever done! After a social evening, and the clocks changing (for some! ), and as it was wild out but fairly dry, on Sunday, all parties decided to walk. One team did a Clapham to Ingleborough loop and fought a strong head and side wind especially coming off the top. Others enjoyed more low level challenges. 3 of us stayed on until Monday, and met friends for a walk from Austwick and the Norbar erratics, to Wharfe etc. Twelve Club Members ignored predictions of travel chaos and made it to Lancashire Mountaineering Club’s ‘The Loft’ situated close to Blea Tarn above Langdale. Road conditions were fine until the last two kilometres which involve 1 in 5 or steeper gradients. Getting out of Sheffield and it’s snow was the an issue for some. The Lakes actually had less snow than most of the rest of the country, but the Blea Tarn road has only one farm and the hut on it and is not therefore gritted. Only Dave and Chris’s early arrival allowed them to get up the hill relatively easily. Mark, David and Gary’s approach required chains after traction was lost two thirds of the way up the hill. Others bailed out at the bottom of the hill. Nigel, Al and Marcus finally arrived after negotiating the hairpin bends from the Great Langdale side using chains – a fine effort! A few drinks were required to settle nerves and a unanimous decision was made to walk from the hut the following day. On Saturday, most of us walked down into Great Langdale and up Oxendale. Mark and David opted for Crinkle Gill with a party of 7 tackling the neighbouring Isaac Gill. Snowy steps lower down gave way to some good ice pitches higher up in Crinkle Gill, with the rope employed on one pitch (Grade II – III). This was followed by a short route on Gladstone Knott, over snow covered rocky steps, again roped (Grade II -III). 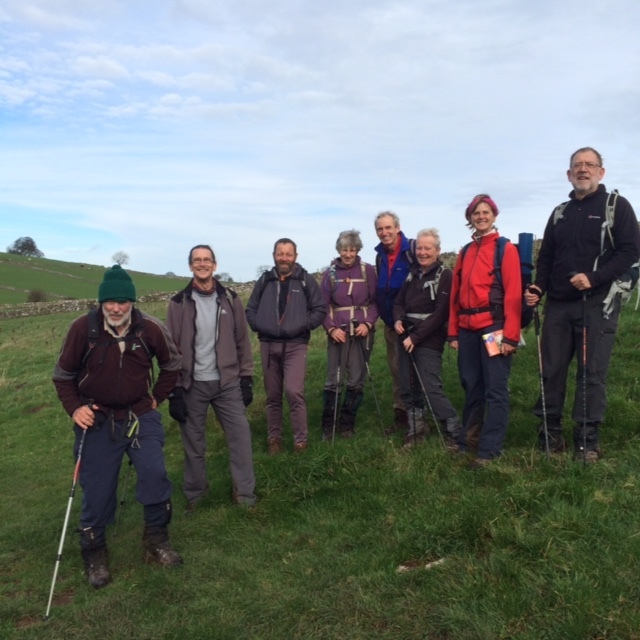 The team of 7 had fun in Isaac Gill (Grade II) though less ice was encountered. Both parties met at the top of Gladstone Knott by chance and a return was made via Red Tarn contouring below Pike o’ Blisco. Dave and Chris separately walked up Pike o’ Blisco. The hut was rather warmer on Saturday night with walls streaming with condensation from steamy bodies and wet gear. There seemed to be plenty of food and drink to go round. Most notable was Al’s impersonation of Desperate Dan where he appeared to eat a whole pig (well at least a small one). We did have to help the neighbour unfreeze the water supply to their house and the hut, but at least only the incoming supply to the toilet and not the outflow was frozen! Sunday saw teams split between Greater Langdale with 4 walking or climbing around Angle Tarn and the rest heading for Coniston. David and Mark climbed the upper section of Low Water Beck (Grade III) followed by South Gully (Grade II) on Low Water Crag. Good ice was again found higher up the gill, although plenty of water was flowing beneath it. One pitch was sufficiently steep to get the rope out and there was even enough good ice to place a few screws. South Gully was predominantly full of powdery snow but there were excellent turf axe placements making for an enjoyable solo. Nigel, Al and Marcus had fun climbing the nearby ‘Mulled Wine’ (Grade II) with Marcus marking his first winter lead. Andrew and Mary tackled a number of ice falls around Levers Water, some sufficiently steep to enable top roping. Teams returned to Sheffield by different routes and different times. Nigel phoned David to check he was not still on the hill to find he was sitting at home. Nigel’s team was sufficiently late back, as they ate in Coniston, to require chains to both get away from the hut and to get back to his house. An excellent weekend with significantly better climbing conditions than predicted. Members were out in force in the Peak District in January following the arrival of snow. On Tuesday 22 January, Mark Procter and David Pendlebury bagged an early 2013 ascent of Kinder Downfall. This ascent made the national press due to some great images from freelance photographer Rod Kirkpatrick. Linda McLeish led a snowy walk in the area of Dale Dyke Reservoir for the Thursday walking group. This was followed by a very well attended ‘Moonlight Walk’ organised by Paul Gibson. Moonlight was in short supply but reflection off the snow meant headtorches were unnecessary and a circuit of the Burbage Valley was made before well-deserved refreshment was taken in The Fox House. On Friday, Tom Corker and David Pendlebury made an early start to climb Wildboar Clough on Bleaklow. Sporting rock and ice pitches were found before an early return to beat the forecast snowfall. Tom is co-author of ‘Scrambles in the Dark Peak’ published by Cicerone.